Former NYT Editor Jill Abramson: Getting back into journalism? Is former New York Times executive editor Jill Abramson getting back into journalism? Yes, according to hints she dropped Monday night during a talk at Boston University. Abramson said she has been exploring the possibility of launching a new journalism start-up with veteran publisher and investigative reporter Steven Brill. The proposed new operation would focus on a few large stories, and it would employ professional journalists at decent salaries, Abramson told a packed hall during a conversation with Times media columnist and B.U. professor David Carr. After Carr teased her about making some news and challenged her to “show a little leg,” Abramson said, “Well. . .” Then she divulged that she and Brill have been conducting talks with investors who might back their proposed venture. 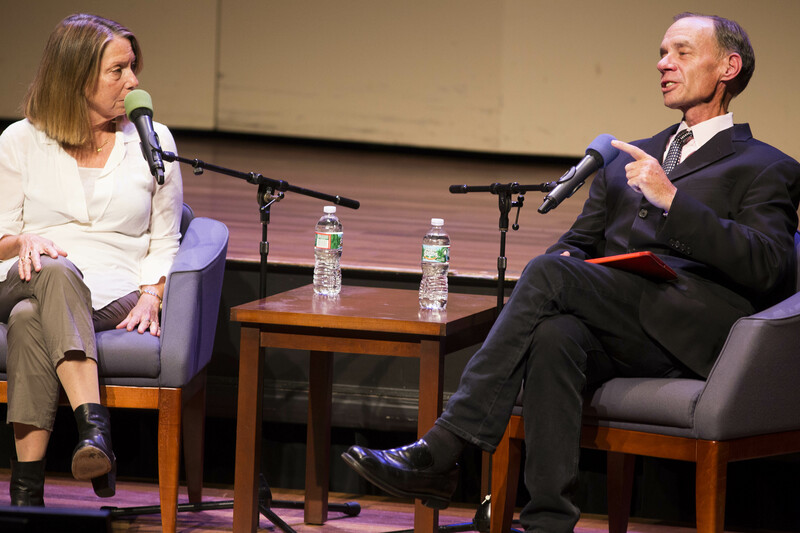 Jill Abramson ( L) and David Carr (R) discuss what David Carr describes as the “present future”, when the production and distribution of media is in constant flux. nterviews (mostly to female journalists), and she has been teaching a course in narrative non-fiction in the English Department at Harvard. When Carr brought up the subject of her separation from the Times and seemed to be groping for a euphemism, Abramson abruptly corrected him, saying “I was fired.” She added that she has spent her career seeking the truth and telling it, so she saw no reason to sugar-coat her dismissal from the newspaper in May at the hands of the publisher, Arthur Sulzberger Jr.
Abramson, 60, began her career in journalism by reporting for and editing a student publication at Harvard, the Independent, then went on to jobs at the American Lawyer, Legal Times, the Wall Street Journal, and the Times. Her conversation with Carr was sponsored by Boston University’s NPR affiliate, WBUR-FM. It was to be broadcast Tuesday evening at 8 p.m..
“offering no details on how her journalism start-up would work financially….she and Brill have been conducting talks with investors who might back their proposed venture”–Brill, a great reporter on Jimmy Carter early and healthcare recently, made fortunes selling The American Lawyer and CourtTV, but appears to have learned that using your own money is for suckers. They appear to want to follow the Pro Publica model of doing good while making sure they do well. She also likely learned her famously abrasive/abusive management style from him, as h e was infamous for his tirades.